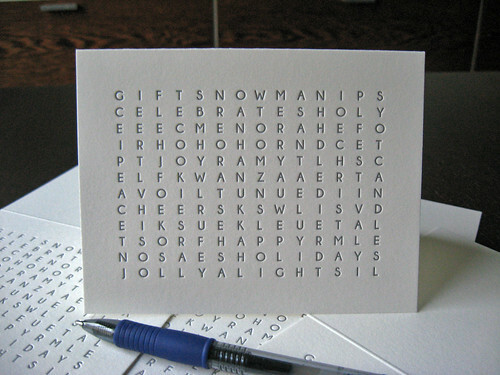 The perfect card for any holiday greeting! 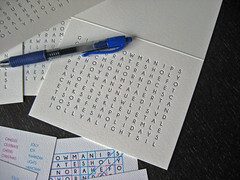 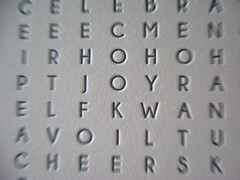 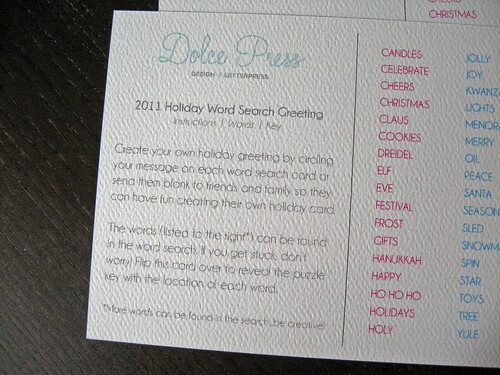 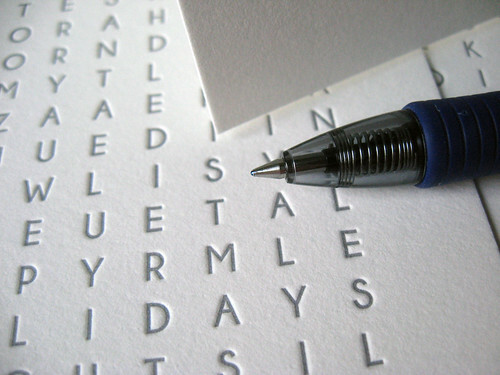 We’re happy to announce another addition to our 2011 Holiday line, the Word Search greeting is something we had a fun time creating. 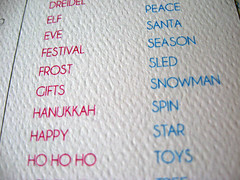 The first thing we did was create a list of holiday words. Once we had our list of 34 – and there was some heated debate!! 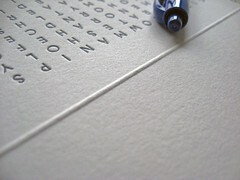 – we started laying out each word. 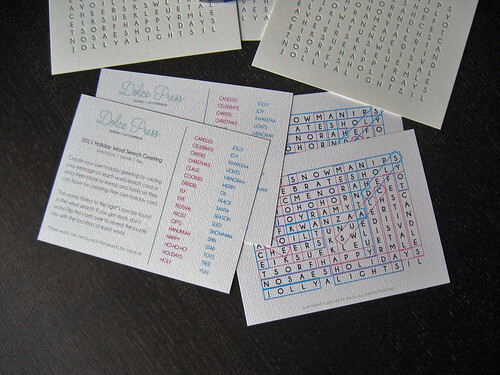 The first 20 or so went pretty fast, but it was those last ones that took some creative work to fit! 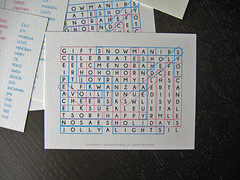 They’re now for sale in our SHOP. 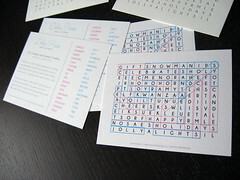 Take a peak at the letterpress cards and the instruction card after the break. 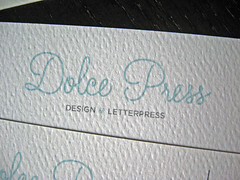 The cards were letterpress printed on a Vandercook Universal III using Crane’s Lettra (110lb Pearl White) for the cards and matching Lettra envelopes. 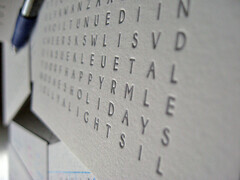 We wanted a neutral color so we used metallic silver ink, a good choice for this text filled holiday card. 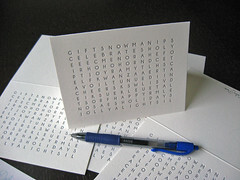 The cards come blank so you can circle your own message or let your friends and family find all of the words themselves! 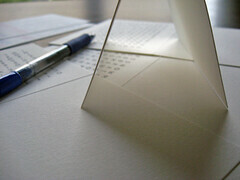 Each card is A2 (4.25″ x 5.5″) sized and creased to create a landscape card. 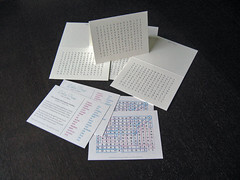 We flat printed the instruction cards using a textured stock. 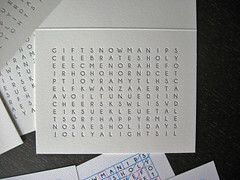 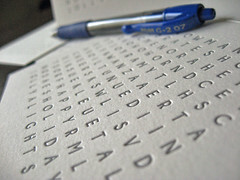 The front of the card has the list of words – we left a few off the list for fun – and a brief description of the card. 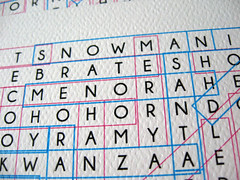 The back has a key to the location of every word, there were so many we broke them up into two groups (cyan / magenta). 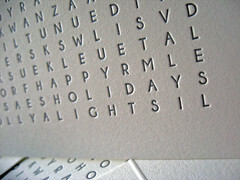 As with all of our cards, they’re available in our online SHOP for purchase. 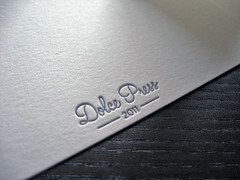 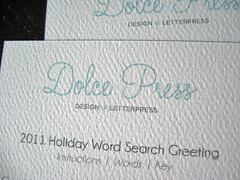 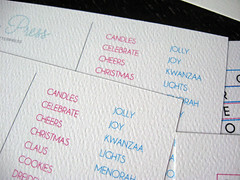 For custom holiday cards, contact us by email at contact@dolcepress.com for more information. 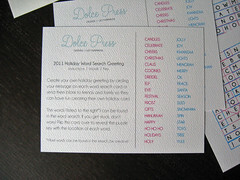 Lastly, LET US KNOW WHAT YOU THINK!